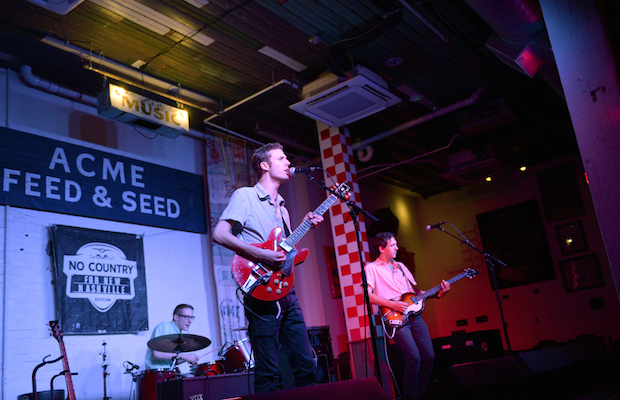 We would like to continue to welcome all of you reading this out there in Music City and beyond to Acme Feed & Seed every Tuesday night, for the weekly showcase from our live events wing, No Country Presents! 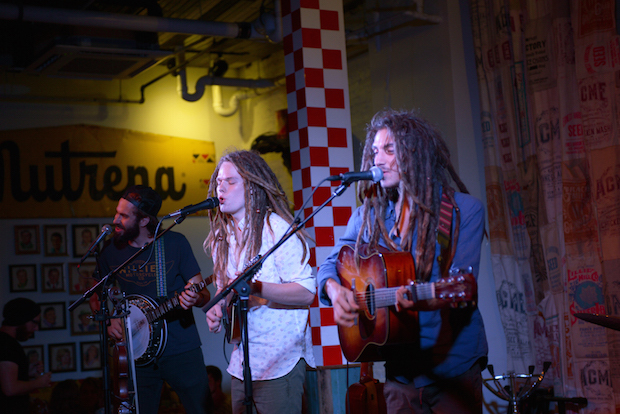 This past Tuesday’s bill featured touring new-grass pickers The Way Down Wanderers, blues guitar shredding singer songwriter Justin Forrest, and in week one of their September residency, indie pop rockers All Deeds Done. Read on for a full recap, and for some great shots from staff photographer Mary-Beth Blankenship. Knowing that a night of heavy drinking was not in the cards for me (I’d spent way too much money at the bar over the weekend), I opted to drive myself downtown for once. Leaving with ample time to take a few laps in search of street parking, I lucked out and snagged a spot near 2nd and Church. Nothing gets one’s mind right like free parking. The Way Down Wanderers. Photo by Mary-Beth Blankenship. With time to spare, I made it to Acme and ordered the only beer I’d have all night from my favorite bartender (hi Sam). Behind on some writing side projects, I’d brought my large notebook and some material I needed to read and take notes on. However, I wouldn’t be getting much work done, because as soon as The Way Down Wanderers started, they had my undivided attention. The fast-paced, five-piece pack of pickers played traditional bluegrass instruments — like mandolin, banjo, fiddle, and upright bass — in unique and fun ways, drawing the large audience in immediately. Their fun take on an older genre was inspiring, and had nearly everyone in attendance at least tapping their foot to the break neck rhythm. Their sound could fit into a sub-genre some have been dubbing new grass music, so if you’re not hip to it, go ahead and google it now. The harmonized vocals were wonderful, and mandolin/fiddle player Collin Krause switched between his two instruments in the middle of songs flawlessly; slinging his mando around to his back, like cowboy would his rifle, and taking up his fiddle from it’s stand without missing a beat. I especially liked the track “No Breaking Now”, off their new EP Wellspring. By the end of their super tight, almost nonstop set, I began to get heavy Trampled By Turtles vibes, and I will be eager to see this young band of musicians grow as they continue to tour the nation extensively. The Acme crowd absolutely loved them, and there were even some die hard fans mixed in from the bands native land of Illinois. The future is super bright for WDW. Justin Forrest. Photo by Mary-Beth Blankenship. Next up was a man you’ve no doubt been hearing a lot lately on Lightning 100. 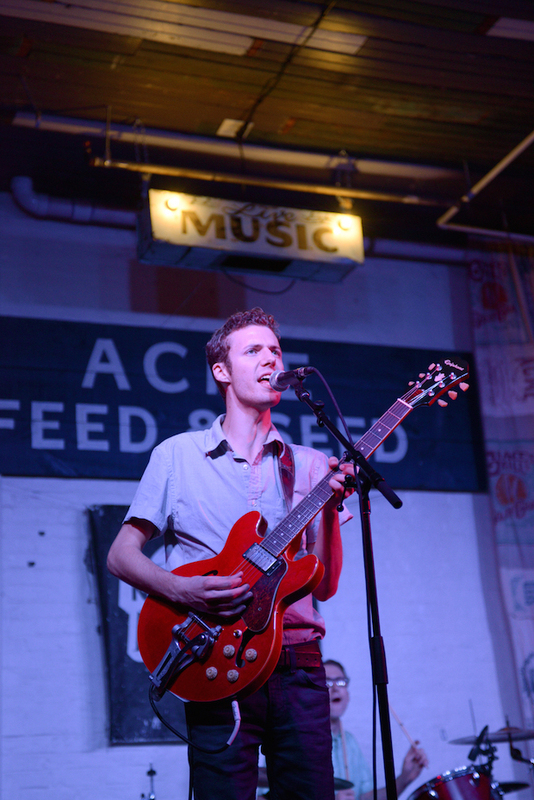 Local Justin Forrest’s single “City Life” has been burning up the airwaves, and his amazing blues guitar shredding was blowing minds at Acme last Tuesday. He started his white-hot set with a bit of the twelve-bar blues classic “Red House” by Jimi Hendrix, not skimping on any chance he got to destroy a solo on his beautifully battered white Fender. He then slipped into an original, highlighting his amazing vocal range, and his blues rock meets pop sensibility arrangements. Think Chris Robinson of The Black Crowes’ voice, laid over John Mayer’s superb guitar picking, and you can get an idea of what Justin has to offer. He bounced around from rowdy rockers, to slower ballads, even going solo and acoustic for one number. His band was super tight and always in time, helping to push Mr. Forrest’s songs to new heights. Of course the highlight throughout the performance was his amazing guitar work (he started playing when he was just seven-years-old), and that alone is reason enough to check him out, but when you throw in the great singing voice, plus well written songs, this dude is ready for prime time. All Deeds Done. Photo by Mary-Beth Blankenship. Closing out another great docket was our current No Country Presents resident band All Deeds Done, who will be on our Tuesday Night Acme bill all September long. We’ve had the power trio in from Bowling Green, KY, before (read this post), and were so impressed, we couldn’t wait to book them again. Now we have them for four weeks straight! 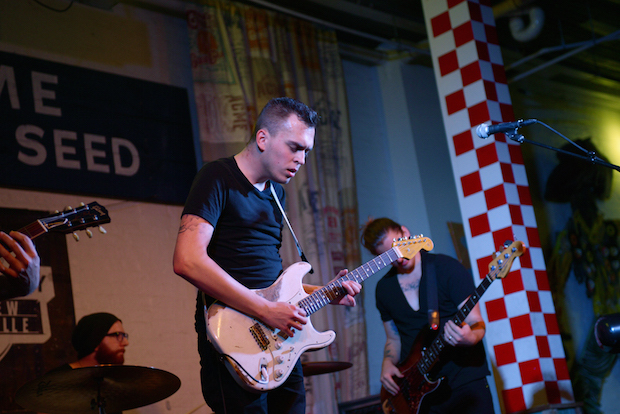 They brought it, with their indie pop, Lightning 100 radio ready tunes like “Dancing On Fire,” which instantly makes one want to bob their head to the beat. The spacey guitar riffs, blended with their wonderfully rich distortion pedals, gives them enough depth/variety to stand out in the ever going local-via-BG scene. Part Arctic Monkeys (minus British accents) and part The Temper Trap, their infectious music was pulling people in off the streets after the usual post-dinner exodus. As word spreads about the next indie band you need in your life, look for the crowds to grow all month long, because these guys are the real deal! While you’re here, please be sure to check out the stupendous photo spread from staff photographer Mary-Beth Blankenship below, and join us next week when we welcome back All Deeds Done, in addition to Perceptive, plus Phil Stanley & Naughty Water. As always, it’s 100% FREE, so we hope to see you there!